Bright Flowers and 14th Century Irish Castle in County Clare. 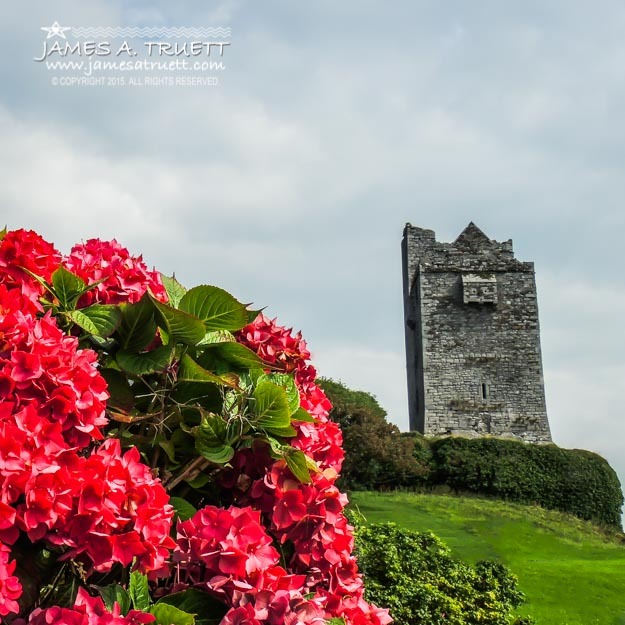 Brilliant red Hydrangeas bloom alongside this 14th Century Irish Castle in County Clare between Doolin and Lisdoonvarna along Ireland’s Wild Atlantic Way. Ballinalacken Castle is a beautiful example of a Medieval Tower House, believed to have been built between the 14th and 16th centuries for the O’Brien Clan, powerful Medieval chieftains of the area now known as County Clare. Signup for my free e-mail updates and receive the first two books of my Mystical Moods of Ireland series as my gift to you. Signup Here! Archaeologists believe the foundations of this stronghold may date back to the 10th Century when the O’Connor Clan occupied this highly defensive spot on a rocky hillside with views out to the Aran Islands and Galway Bay. Adjacent to the castle is the Ballinalacken Country House & Restaurant, a 12-bedroom boutique hotel originally built by Lord O’Brien in the 1840s as his country retreat. The O’Callaghan Family purchased the property in 1938 from the O’Brien Clan and established the small luxury hotel, featuring traditional-style rooms in Victorian style. A great location for touring West County Clare, it’s close to one of the area’s best beaches at Fanore, plus it’s conveniently located on the edge of the Burren, only a stone’s throw away from the Cliffs of Moher.